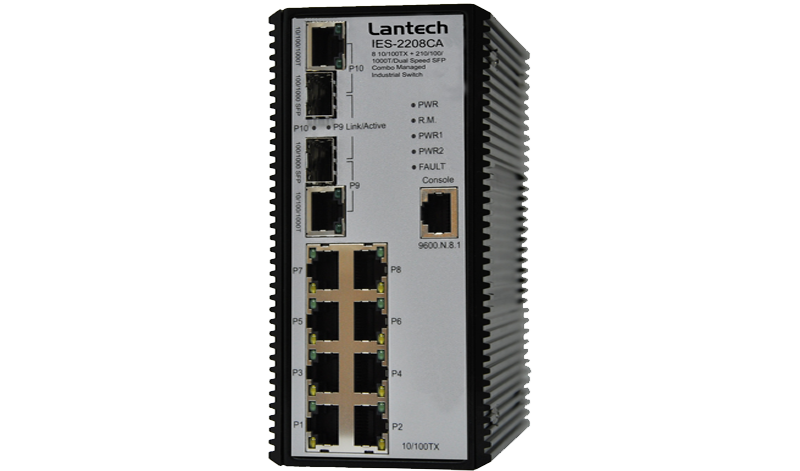 The Lantech IES-2208CA is an 8-port 10/100BaseTX + 2-port 10/100/1000T/Dual Speed SFP Combo industrial Ethernet switch with Pro-Ring2se self-recovery scheme in 20ms. The SFP connection is suitable with 100M or 1000M Dual Speed. The advanced SNMP management features include QoS for 4 queues, 802.1q VLAN, IGMP snooping, query and source only for multicast IP surveillance, DDM*** as well as Web Ping, CPU load monitoring, SNTP and SMTP etc. Modbus/TCP** protocol is supported. It’s used for communications over TCP/IP networks for factory automation. The Pro-Ring2se self-recovery scheme can recover Ring network in less than 20ms with single ring up to 50 switches with one step setup. Lantech IES-2208CA builds all the important management features required in large network like DHCP Client/Server, 802.1X authentication, IGMP Query / Snooping, and advanced QoS. The exclusive source only function is good for reverse multicast flow which can automatically select the query (router port) in a ring for IP surveillance application. It also supports Ping commands via Web to detect whether a specific device is still connected for easy trouble-shooting. The IES-2208CA has the relay contact that is able to connect with alarm system and send Email and SNMP trap alert in case of power or port failure. It also has the built-in factory reset button can restore all setting back to factory default. The IES-2208CA is designed to meet with critical network environment with IP 30 enclosure and test under extensive Industrial EMI and Safety standards. With UL Class I Division II / ATEX Directive 94/9/EC approval, the IES-2208CA-C1D2/ATEX can be implemented in hazardous or explosive condition without accelerating the damage. It’s the best choice for inflammable environment where the liquid, gas and vapor etc might present the hazardous condition which generally to be find in mining, oil & gas, chemical, processing automation areas. It’s also suitable for surveillance, factory automation, transportation, telecom / ISP outside terminal, heavy industrial factory and other factory assembly lines. The -E / -C1D2/ATEX / -DNV model can be used in extreme environments with an operating temperature range of -40°C to 75°C. The Lantech IES-2208CA-DNV meets with the most critical test criteria in DNV Type* test directives consisting of MED (Marine Equipment Directive), EMC (Electromagnetic Compatibility Directive) and LVD (Low Voltage Directive) in which vibration, high voltage, compass safe distance, salt mist tests, humidity etc are conducted to ensure the switch sustaining the harsh on-board environments often founded in Ships, Crafts and Offshore platforms. Pro-Ring2se Pro-Ring 2se system Topologies for network recovery in less than 20ms up to 50 switches. Note:Pro-Ring2s is not compatible with Pro-Ring2s/Pro-RingII/Pro-Ring I; 20ms recovery is on fiber port.